Adding pimento-cheese biscuits is a big bonus. This time of year, I could live on tomato sandwiches. But it’s hard to make a sandwich out of cherry tomatoes, and I have loads of cherry tomatoes. I don’t know what it is, but I can’t resist buying them when I see them at the farmers market. If you are like me and have a glut of cherry tomatoes, this recipe is for you. Often, I make a simple fresh tomato sauce with cherry tomatoes, but this week, on a rainy day, I was craving summertime comfort food. There is nothing more comforting than homemade biscuits and I had all those cherry tomatoes. so I decided to combine them and make a biscuit-topped cobbler. Just the idea of it hit the spot. To be honest, I had never made a tomato cobbler or even tasted one, but it made so much sense. Once I decided to make the savory cobbler, I thought of one of my favorite childhood sandwiches; a hot open-face pimento cheese and tomato and so, pimento-cheese biscuits it would be! I wanted the cobbler to be simple and showcase the fresh vine-ripened local tomatoes, so I kept it to basically two ingredients, leeks and tomatoes. I sweated three leeks with olive oil, salt and white pepper, but you could use about half as many shallots instead. Once they were soft and fragrant, I deglazed the pan with balsamic vinegar which would be the “tang” in the cobbler. I gently mixed in the clean, whole cherry tomatoes and seasoned them with salt and granulated garlic – not wanting to add any more “wet” ingredients. Finally, I added some corn starch to thicken the juices. I wanted the cherry tomatoes to cook in a similar manner to a berry cobbler. Since the filling was so simple, I decided to up the ante on the biscuit topping. When I make a sweet cobbler, I make sweet cream biscuits but since the tomato cobbler was savory, I decided to make my “Praise the Lard” biscuits and add pimento cheese, turning the biscuit topping into pimento-cheese biscuits. Depending on the size of your biscuit cutter and your pan, you may need to cut some of the biscuits in half to fit. You want the biscuits to be close together, but leave a little room for rising. Make sure to bake the cobbler long enough so the biscuits are cooked all the way through. If you have any extra dough, you can make extra biscuits on the side while you are baking the cobbler – but remember that the biscuit will only take about 10-15 minutes to bake. After nearly an hour in the oven, I was more than rewarded. 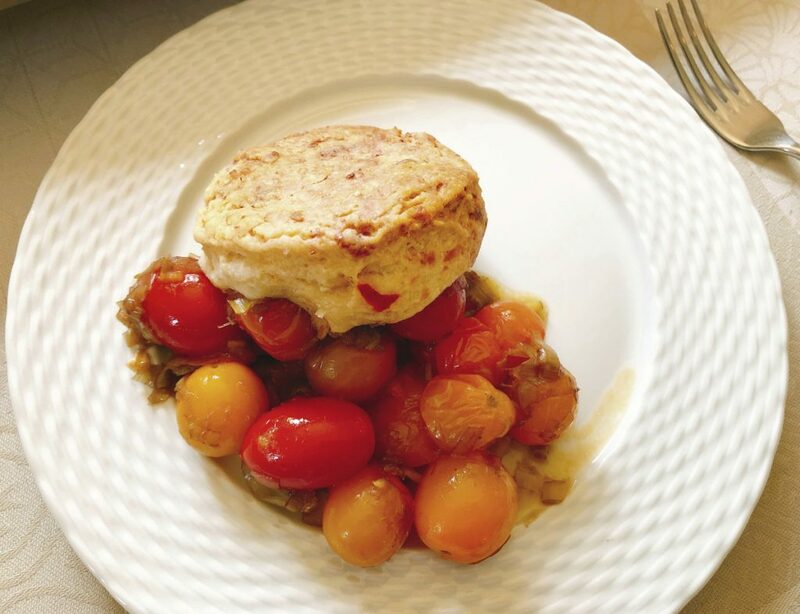 Although the ingredients were few, the combination of the leeks, farm-fresh cherry tomatoes and the balsamic vinegar baked into a luscious, complex filling that was perfectly accented by the flaky pimento-cheese studded biscuits. I may never eat cherry tomatoes any other way – this is one dish that I am going to have on rotation until the vines run out of cherry tomatoes. Heat oven to 375 F. Place parchment paper in cookie sheet or half-sheet pan. Pick the stems off the cherry tomatoes and rinse them under running water. Do not cut the cherry tomatoes – you want to keep them whole so they cook and collapse on themselves but do not become a liquidy sauce. Meanwhile, mix the cornstarch, remaining 1/2 teaspoon of salt and granulated garlic together. Add the corn starch mixture to the leeks and mix well. Add the cherry tomatoes to the hot leeks. Stir gently until the leek mixture is evenly mixed with the tomatoes. Let sit for an hour. Pour the cooled leek-tomato mixture into a square baking pan and set aside. To prepare biscuits: place 2 cups of flour in large bowl. Add the pimento cheese. Cut in shortening, using a pastry blender or blending fork (or pulling 2 table knives through ingredients in opposite directions), until mixture resembles coarse crumbs. Add 1/2 cup of buttermilk; stir with fork until soft dough forms and mixture begins to pull away from sides of bowl. If the dough is too wet, add the extra 1/4 cup of flour, little by little. If it is too dry, add the extra 1/4 cup of buttermilk, little by little. On lightly floured surface, knead dough 1-2 times, or just until smooth. Do not overwork the dough. Roll out dough to about 1/3-inch thickness. Cut straight down with a floured biscuit cutter (2- to 3-inch round cutter) – do not twist the cutter. You will need 7-9 biscuits to cover the top of the baking pan, depending if you use an 8 x 8 or a 9 x 9 baking pan and how big your biscuit cutter is. Bake the extra biscuit dough to serve on the side. Place the biscuits over the tomatoes. You may need to cut some of the biscuits in half to fit the pan. Brush the biscuits with a little melted butter. Place the baking pan on the sheet pan to catch drips, and then transfer to the preheated oven. Bake for 50-60 minutes, until the tomatoes are very bubbly and the tops of the biscuits are nicely browned. When the cobbler comes out of the oven, brush tops again with the melted salted butter. Transfer from sheet pan to a cooling rack and let the cobbler rest for at least 15 minutes before eating. If it is too dry, add more mayonnaise. Grind 2-3 coarse rotations of fresh black pepper on the pimento cheese and mix well. Taste for seasoning and adjust with pepper or mayonnaise as needed. I find that the cheese and mayonnaise are salty enough and you will not need to add any salt. Spoon pimento cheese into a glass jar with a fitted lid – I like to use a wide mouth mason jar which then makes a nice serving dish as well. The pimento cheese is good immediately but is even better the next day.